I am nearing the end of my third trip to Accra, and in spite of having spent nearly three months in Ghana in 2016, I've still barely seen any of the country. This trip, I haven't even left the city once. And yet I've managed to make it another country - and not even one of the neighboring ones! I will admit that until the day I booked my plane ticket from Accra to Sao Tome, I could not have placed it on a map. And then a friend in Ghana wrote to say there was a direct flight from Accra to Sao Tome and did I want to go next weekend? Never one to turn down a chance to visit somewhere new, I bought the ticket and showed up at the airport, leaving the rest of the details to Samantha. An easy hour-and-a-half flight on TAP Portugal (with the world's happiest flight crew - because they fly in Friday and fly out Sunday) landed us in the capital city of Sao Tome right at sunset. Two of our group had arrived on Wednesday and they pulled up to the airport in a our rental car, driven by someone else - a guy they'd met at a coffee farm who'd taken them to find a waterfall and then drove them to the airport to meet us and got his own ride home. In many ways, this set the tone for the trip - people were very laid back, very helpful, and very trusting. As the taxi driver we were chatting with outside the airport told us - Sao Tome is "tudo tranquilo" (literally "all calm", but essentially - super chill). I only had two days to explore this paradise, but we crammed in as much as we could. Beaches, cloud forests, city wanderings and quiet hikes. And everywhere we turned, a beautiful view and a delicious meal. On Saturday we drove north in search of a beach to do some swimming and snorkeling. Our first attempt was a bust - the Blue Lagoon was lovely but not really the beach we were looking for. After consulting google maps and some friendly locals, we headed towards nearby Praia dos Tamarindos. It took us nearly an hour of crawling along rutted dirt roads through tiny villages, but we made it and it was pretty spectacular! We were not alone on this gorgeous stretch of beach - it turns out there's a much easier road that we missed in favor of our off-road adventure. It only took us 15 minutes to get back to the main highway! From there, we headed up the mountains into the cloud forest. It went from sunny and warm to cool and raining in a matter of 30 minutes - I love that such a small island has so much contrast. We explored the botanical gardens and went for a short and very muddy hike. We were too late in the day to do any real hiking, but there are supposed to be some beautiful (and strenuous) trails heading out from the botanical gardens. We used the Trip Advisor Top 10 as our guide, but half the places on it had moved/were closed. No matter, wherever we wound up, we had seriously delicious and incredibly cheap meals. In Sao Tome city we enjoyed the queijo de ilha (island cheese), burgers, salads, garlicky shrimp and cheap wine at Xico's Cafe; the random bar carts scattered throughout the city; and Papa Figo, a lively seafood restaurant where I had an amazing peixe grelhado (grilled fish) with garlic sauce. We were also a little bit obsessed with the Super CKado grocery store, which is a lovely place to stock up on local chocolate and Portuguese wine. Walking around Sao Tome in the evening - very tranquilo. That local cheese plate - with truffle honey. SO GOOD. But the culinary star of the weekend was a trip to Roca Sao Joao dos Angolares, a restaurant in an old colonial hotel that's known for the tasting menu at lunch. We arrived early and enjoyed walking around the grounds, and then we settled in to the open-air dining area for an incredible experience. Chef Joao does an island-Portuguese fusion cuisine that really celebrates locally available products like seafood, tropical fruits, and chocolate. We enjoyed a leisurely parade of small plates, a family-style main of rice, chicken and a spicy green sauce, and two desserts. All for an unbelievable 17 Euro. It was a really special experience and a great way to end our weekend. The nation only gained independence from Portugal in 1975, and the influence is still very strongly felt in the language, the food, the architecture, and the preponderance of Portuguese tourists. There are no foreign ATMs on the island (bring Euros or dollars!) The dobra currently is about 25,000 to 1 Euro. Not much English is spoken. My Spanish helped some, as did having a couple of French-speaking folks with us (they teach French in school since Gabon is their closest neighbor). Incomes are low, but Sao Tome scores well on the UN's Human Development Index relative to other Central and West African nations, thanks to government investments in health and education. People there also told us that they may not have much money, but on a small island people look out for each other so people don't go hungry. The airport has only one gate, so we weren't expecting much - but there's a nice (though overpriced) gift store inside with lots of spices, chocolates and crafts to take home. There's also a small bar if you want to spend your last dobras on a cerveja Nacional. Lots of colorful wood houses. 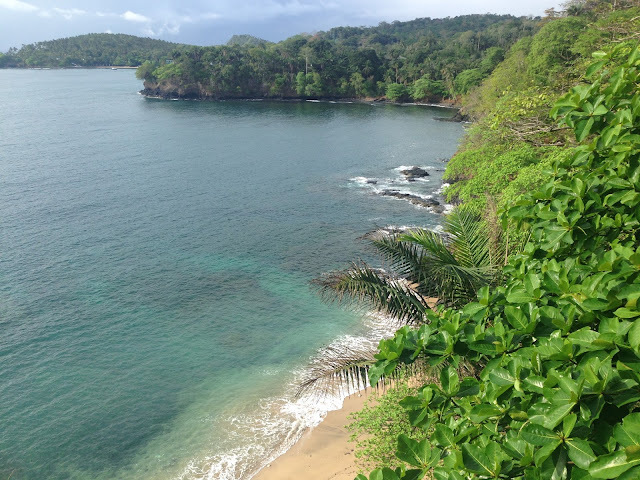 Getting there: So, as amazing as Sao Tome is, there's a reason it's a hidden gem - it's not easy to get to! The only flights into Sao Tome come from Lisbon (with a stop in Accra), Angola, Cape Verde, Gabon and Equatorial Guinea, and most of those only run a few days a week. But if you find yourself in one of those places, it's absolutely worth the trip! 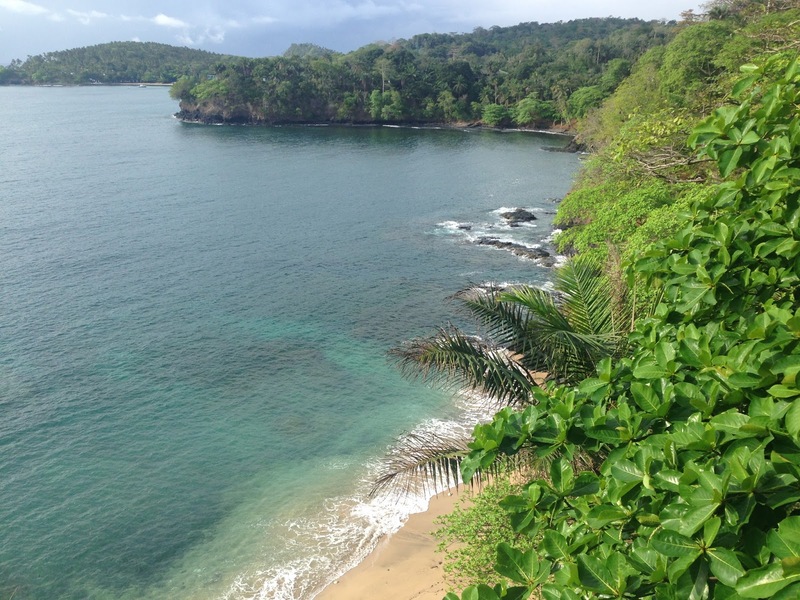 Accommodation: We stayed at Casa Ondas Divinas in Santana. There are multiple cottages of varying size/price. Ours was simple but lovely, breakfasts were tasty, and the views were incredible. Owner Yves speaks fluent English, French, and Portuguese and can arrange for anything from a rental car to money exchange to surf lessons. Just be patient, as everything happens on island time! Getting around: Our Airbnb host arranged a rental car for us that was waiting at the airport, and he just had us park it and leave it there when we left (easiest rental car process ever?). We met folks who got around without a rental vehicle, but it gave us so much more freedom and allowed us to get to places we never could have gone on public transport. Be sure to get something with decent clearance and preferably 4x4 - even the main roads have potholes, and anything off the main road is likely to be dirt.